subgenus Pinus, section Trifoliae (Duhamel), subsection Ponderosae (Louden). 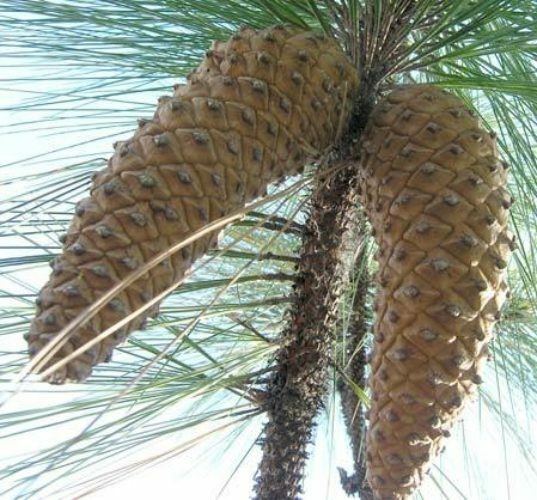 Pinus devoniana, first described in 1839 by John Lindley (1799–1865), is commonly known as Michoacán pine as well as pino lacio, tsihiréen, pino escobetón, ocote gretado, ocote macho and pino blanco in the Spanish language and Mexican dialects. The species name honors William Spencer Cavendish, sixth Duke of Devonshire (1790 - 1858), who had a great interest in gardening. 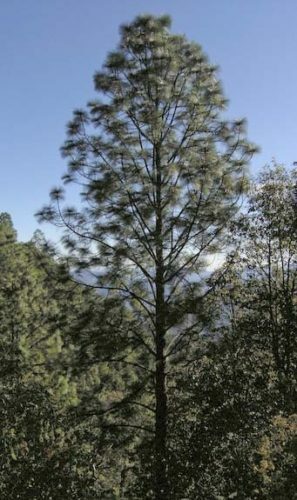 One of the many synonyms for this pine is P. michoacana (Martínez 1944), which many authors consider a more appropriate name based on its origin versus politics. Ethnobotany. The wood is of good quality, and is for joinery, furniture, boards, parquet, firewood; and pulp and resin production. Description. Michoacán pine is an evergreen, coniferous species of tree that grows to mature heights of 65 to 100 feet (20 - 30 m) tall with a single erect trunk 32 to 40 inches (80 - 100 cm) in diameter, measured at breast height. The tree's crown is open, broadly pyramidal or domed and is formed by long, spreading or ascending first-order branches with sparse, spreading and ascending higher-order branches. 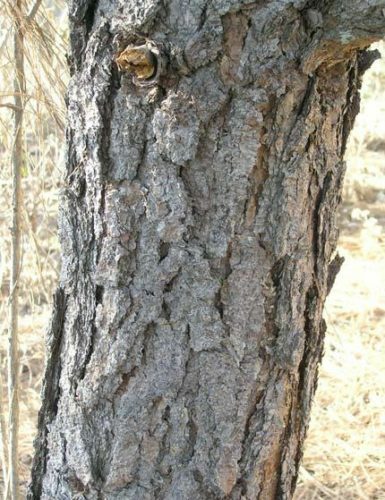 Bark is colored red-brown to dark brown, rough in texture. With age, it forms elongated plates divided by deep, black longitudinal fissures. Shoots measure 0.6 to 0.8 inch (15 - 20 mm) thick; and are rigid, rough and scaly, with persistent, decurrent pulvini. Terminal foliar buds are 0.8 to 1.2 inches (20 - 40 mm) long, laterals are smaller. Overall, they are ovoid-acute in shape, not resinous. Bud scales are imbricate with ciliate margins, colored orange-brown to red-brown. Foliar units grow in dense tufts toward the ends of upturned branches. Fascicle sheaths measure up to 1.2 to 1.6 inches (30 - 40 mm) long, and are persistent for the life of the fascicle. Leaves (needles) are borne in fascicles of 5, persisting 2-3 years on the tree, varying from rigid and straight to flexible and drooping. They measure 10 to 16 inches (25 - 40 cm) long and 0.044 to 0.064 inch (1.1 - 1.6 mm) wide, and are acute-pungent, bright, lustrous dark-green in color, with stomata on all faces, 5 to 9 lines on the abaxial face and 3 to 6 lines on each adaxial face. Pollen cones grow crowded near proximal ends of new shoots, subtended by long, subulate bracts with ciliate margins. They are cylindrical in shape, 0.8 to 1.6 inches (20 - 40 mm) long, colored pink-purple turning light brown. Seed cones grow subterminal to the shoots, whorled in groups of 1 to 4. Immature cones are often erect, recurving after pollination, on thick, bracteate peduncles. Cone are ovoid-oblong shaped, purple-brown purple brown in color, maturing 2 years after pollination. Mature cones are on short, persistent peduncles, leaving a few scales on the branch when falling. They are typically ovoid-oblong shaped with an oblique base, measuring 6 to 14 inches (15 - 35 cm) long and 3.2 to 6 inches (8 - 15 cm) broad when open at maturity. Seed scales number 175 to 225, with raised apophyses, transversely keeled, rhombic with irregular sides, up to 1 inch (25 mm) wide, and brown in brown. Umbos are dorsal — raised, flat or depressed, gray-brown in color, and up to 0.28 inch (7 mm wide), terminating in a small, usually deciduous prickle. Seeds are obliquely broad ovoid, flattened, 0.32 to 0.4 inch (8 - 10 mm) long and 0.2 to 0.28 inch (5 - 7 mm), light brown in color, often with dark spots. Seed wings are articulate, obliquely ovate to oblong shaped, 1 to 1.4 inches (25 - 35 mm) long and 0.4 to 0.6 inch (10 - 15 mm) wide, colored light brown with darker stripes. It can be distinguished from similar species, such as P. montezumae, by "its thick, shaggy branches, its long and stiff, lustrous green leaves with very long, dark, resinous fascicle sheaths, and the very large, thick woody cones. Distribution. This species is native to Mexico — Aguascalientes, Chiapas, Distrito Federal, Guerrero, Hidalgo, Jalisco, México, Michoacán, Morelos, Nayarit, Oaxaca, Puebla, Querétaro, San Luis Potosí, Sinaloa, Tlaxcala, Veracruz, Zacatecas; and the southern highlands of Guatemala. P. devoniana is found growing at altitudes of 3,000 to 7,500 feet (900 - 2,500 m) above sea in areas with a warm-temperate to subtropical climate and precipitation of 40 to 60 inches (1,000 - 1,500 mm) per year with a November to May dry season. It occurs on a wide variety of soils. Its principal habitat is open pine-oak forest; fire is relatively common in these settings and P. devoniana has a number of adaptations for fire, such as a juvenile "grass stage" similar to that of P. palustris of the SE United States. 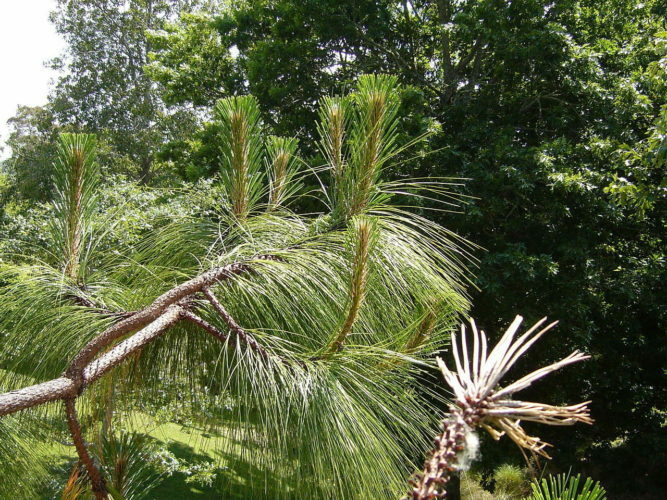 Pinus devoniana at Hackfalls Arboretum, Tiniroto, Gisborne, New Zealand. Pinus devoniana — nearly mature seed cones. Pinus devoniana — a mature tree growing in habitat. Pinus devoniana — bark detail.